Remember HER nice lush plant? This morning a new pup met us at the river. Roxy met her a few weeks ago; but this was the first time Bella and I had seen her. Her name is Zuleika. She's a 7-month old Labrador. Roxy was a pest at first and made Zuleika nervous, but after Zuzi gained her confidence, she was right into all of our games. I stayed away from those wild girls and did my own thing. We're nearly out of the frame in this picture because by the time SHE hit the shutter and the camera took the picture, we'd moved. 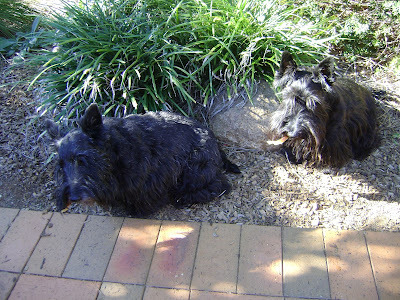 This is Bella and I enjoying the beautiful AFTERnoon, AFTER baths and AFTER bones. Roxy is around back trying to get all the chew left in our bones. Hope your Saturday is splendid. We're having computer problems. Don't know if it's the internet or computer program. Whatever, we have difficulty in connecting and sometimes we lose the connection between reading posts. So if we haven't been around that's the problem. We'll try to visit soon. Today is ANZAC Day. It's the day we remember all those who have given their lives, served or are serving in wars. Every city, town and many villages hold remembrance ceremonies. There are official services held in Gallipoli (Turkey) and Villiers-Bretonneaux (France) the sites of battles in WWI, where Australia and New Zealand fought as separate entities instead of just part of the British Empire . Therefore, it is also very important to both countries. It does not glorify war....quite the opposite. Bella watched the whole Sydney parade.....over 2 hours....and then the Gallipoli Service on television. 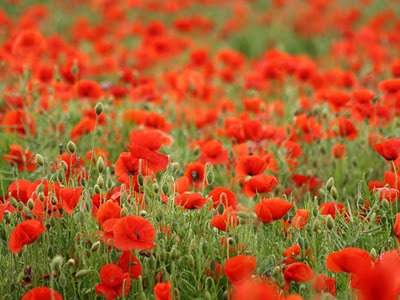 There are always huge crowds of people waving flags and sporting sprigs of Rosemary, for remembrance and red poppies. The Ode is recited at all services. It's a verse from "The Fallen". Red poppies were among the first flowers to grow among the graves in Northern France and Belgium. This is the new cat that appeared in our neighbourhood. He came up through the storm-water drain. Take a good look at him. We think he's very old or sick or both. He's just fur and bones and can hardly walk. He has come to the right house. The people who live there, go out every morning and evening to feed the feral cats around town. They sometimes catch sick cats and take them to the vets for treatment and to be desexed then release them. They have three big cats in their house and a kitten that they hand reared for their son; but their son can't take it now. They also have two rescue dogs. We think this cat must have had a family in the past, because he's very friendly and didn't object when he got a bath and a clip. Because it could have cat aids, or flu or something, he is not allowed inside. Instead, he has a large dog kennel near the door with an electric blanket as well as other blankets. but he's still a cat, and we bark at him! New Cat in the 'hood!!! A package arrived at our house, addressed to HER. SHE started to open it, and then realised it was really for US. Roxy who's very nosy raced over to look. Then I had a look and pulled it out. It was a Kong Tugger Knots moose with a squeaker. Roxy grabbed it and tried to hide it in the bushes. She thought it was hers, but NO WAY was I going to let her. I grabbed an end and it became a game of tug. We played for a long time--it's my favourite game. Then I let her have it. It sure is strong. SHE renewed a subscription to 'Dog's Life' and we got this toy FREE. I predict lots of tug games in the future! We went to the river at the Devil's Elbow again this morning. The river was low and we had our beach back. Everyone was there. Roxy chased her boyfriend, Jake. Bella went swimming and dug a few holes. I just had a wonderful time. Our very first--EVER bully sticks! There are some fantastic 'bento' or packed lunch ideas...a bit different to the usual sandwiches. Thanks for the Birthday wishes, Sparhawk scotties! Our Easter Sunday ended with a walk on the bicycle track along the river to OUR beach. Roxy didn't want to cross the bridge at first, but decided if we did it, she could too. The evening was cool, so there were lots of people out walking, jogging, cycling, on scooters, fishing and kayaking. Our beach is still very small and because there were fishermen, we couldn't get off the leads. On the way back, Bella stopped to lick some water out of the tap. I'd already had some. We ran into our friend Gwen Stefani! We haven't seen her since before Christmas. There were so many snakes around in the Spring that we didn't go down there. We had some great chasing games. We love Gwen. And now that it's getting cooler, we'll be walking along the river again. It was a wonderful day. We took this sunset on the way home.